Put the butter and sugar into a mixer and whiz up until light and fluffy. Pour in the vanilla essence and add the eggs - whiz again to make a batter. Add the sieved flour and stir until it is smooth. Pour into muffin size cupcake cases. Bake for around 14 minutes – be sure to keep an eye on them! They will be perfect when they bounce back to the touch and the top still looks slightly sticky. This will ensure they keep their moisture. Leave on a cooling rack for 30 minutes or until cool. To make the buttercream icing, take your 8oz of softened butter and 12oz of icing sugar and beat together until it becomes fluffy. Split the mixture into two bowls and add food colour, one to each bowl (purple and pink). 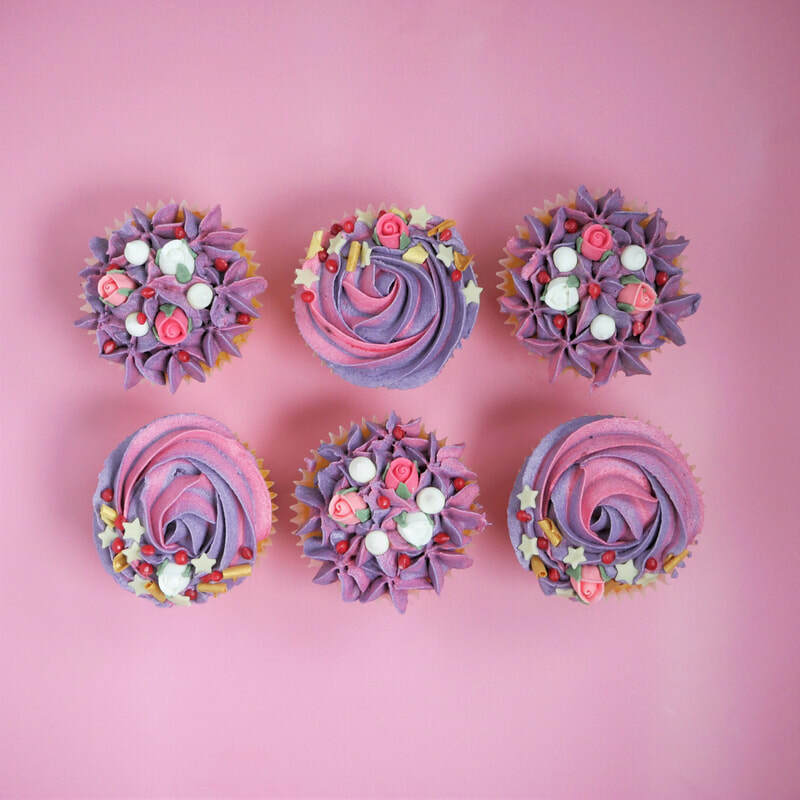 Fill your piping bag (fitted with a star nozzle) with a spoonful of each colour, alternating until the bag is nearly full. 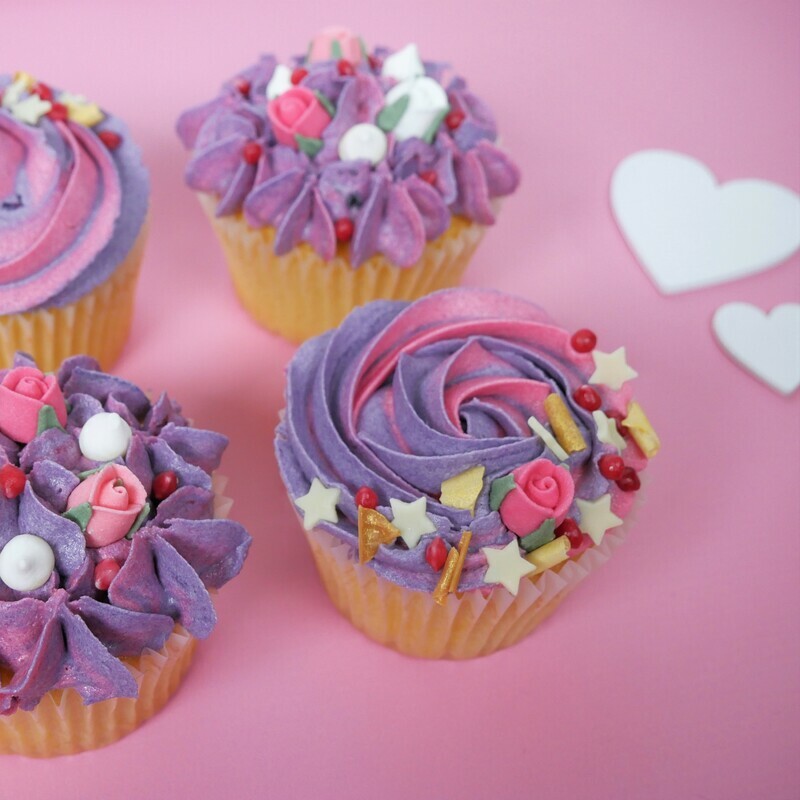 This will give you the marbled effect when piping your design onto the cupcake. Once piped, decorate with Cake Angel She Loves Me 2Ds and Sweetie Pie Sprinkles.